You don't need a degree to be a t-shirt surgeon ;)! 1. 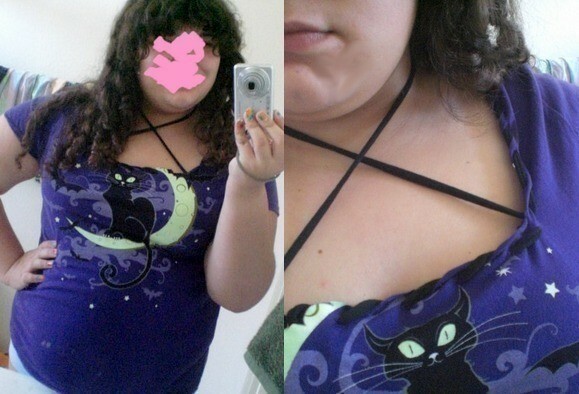 Kitty top. I cut a square neckline, laced some black tshirt scraps around the neckline, leaving two long pieces that can be tied around the neck (like shown) or in other ways. 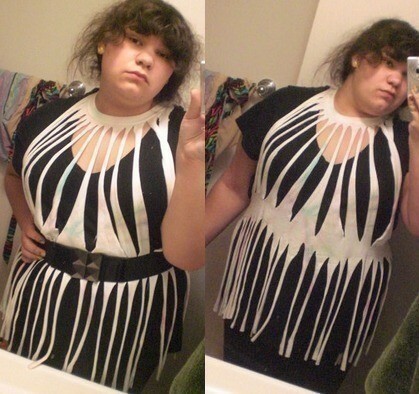 2.Fringe halter. This project was done really quickly, so its not the best looking. But I LOVE it! I plan on making another, in a colored shirt. WOW!! You are very talented!! Great Tee's!! The White One is my Fav.!! Must add to my "to do" list! It's really easy. No sewing involved. Oh my gosh! It's funny that I have that SAME EXACT kitty shirt! XD Now I want to modify it like yours!